January 29, 2018 — Lehigh Valley, Pa. Judith’s Reading Room, a non-profit literacy organization founded in 2010, is currently accepting applications for its 2018 “Freedom Through Literacy” Award. Changes to the 2018 Award will encourage teachers, librarians and authors both here and around the world. The 4th annual “Freedom Through Literacy” Award, the signature element of Judith’s Reading Room, will honor a Top Prize winner with $3,000 cash. The “Judith’s Award,” a new prize category, in the amount of $500, is designed exclusively for teachers, librarians and authors. They are also eligible to win the Top Prize. “Board Option” this prize engages board members to be “on the lookout,” constantly, for exemplary individuals whose work instills in others a love of reading. Applications for the 2018 “Freedom Through Literacy” Award are available on line at www.JudithsReadingRoom.org/APPLY. Anyone working in the field of literacy — teachers, librarians, authors, educators, booksellers — is encouraged to apply. Deadline for Applications: July 6, 2018. 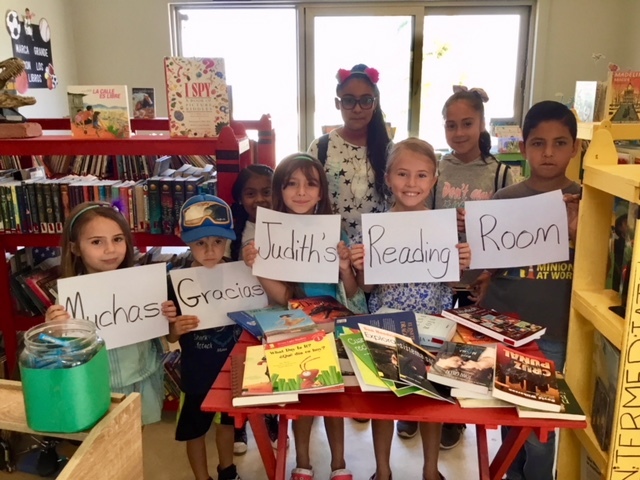 Since its inception in 2010, Judith’s Reading Room has dedicated 95 libraries in 18 countries with over 127,000 books valued at nearly $1.4 million dollars. Since 2015, $24,500 cash has been awarded to winners of the “Freedom Through Literacy” Award. Por fin or finally as we say in English! Here is a foto of a few of our 162 “card-carrying” library enthusiasts waiting eagerly to get their hands on the new books donated by Judith’s Reading Room. Just as there are only a very few of the kids in the foto, it is also only a portion of the books that were purchased with your generous donation. The others flew off the shelves before the foto could be made. Not a day goes by that one of the books that Judith’s Reading Room purchased is not being checked out for the enjoyment of our kids. We can’t thank you enough…. Tagged 2018 Freedom Through Literacy Award, Press Release.